A home to abundant beauty and other attractions the province of Newfoundland and Labrador spreads in an area of 405, 212 square kilometers comprises of island of Newfoundland and the mainland Labrador on Canada's Atlantic coast. The name Newfoundland is English in origin while Labrador is derived from a Portuguese explorer Joao Fernandes Lavrador. The province is large and diverse. The landscape ranges from the barren rocks to green lively farmland to deciduous forest to fjord. With over 1500 kilometers of coastal and cross island hiking trails through a huge landscape, the habitat of countless land and sea creatures, Newfoundland and Labrador is believed to be a place where land, water and sky come together. The central part of the province is a home to the largest portion of wilderness on the island and an immense variety of wildlife. Big dense forests, lofty Appalachian-chain mountains, beautiful and quite lakes, stunning landscapes, freshwater adventures, hunting, fishing and much more are great pulls to the province. A sail through the shores of Newfoundland and Labrador will confront you with the beauty of pristine coastal waters, extensive coastline and picturesque sites along with it and you might even get to see one of the most magnificent creatures on the planet, the Humpback Whale. All in all the Newfoundland and Labrador province is just the ideal place for all the water aficionados. However the inland region in the diverse countryside offers several other adventures such as wildlife watching, skiing, hiking etc. 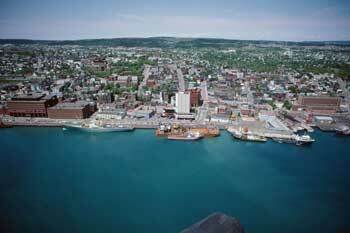 The capital city of this province is St. John's. Located on the northeast coast of the Avalon Peninsula in the southeastern Newfoundland this beautiful city is also the largest in the province. On turning the pages of history we get to confront the glorious past of Newfoundland and Labrador. The Newfoundland region has witnessed some of the oldest European settlements. Some remnants and artifacts discovered there confirm these early settlements. During the 15th and 16th centuries the Beothuks resided in the area. After Beothuks came the Mikmaq, the First Nations People. On 24th June 1497 John Cabot discovered the Newfoundland landing at Bonavista. He was the first European to do so. On 5th August 1583, Sir Humphrey Gilbert formally announced Newfoundland as England's first overseas colony under the Royal Prerogative of Queen Elizabeth I. In 1638 Sir David Kirke was made the first governor of the entire Newfoundland region. In 1690 New France explorer Pierre Le Moyne d'lberville conquered the island. In 1832 Newfoundland acquired a colonial assembly, also known as the House of Assembly. In 1854 the British government installed a proper government in the region. On 26th September 1907 Newfoundland acquired the status of a dominion. In 1946 an election was held for the Newfoundland National Convention to decide the future of Newfoundland. On 31st March 1949 Newfoundland joined Canada after the second referendum. After its entry into Canada, the province came to be known as Newfoundland but in 1964 the provincial government has named itself as Government of Newfoundland and Labrador.